In 2-quart saucepan, mix 3/4 cup sugar and the cornstarch. Stir in water and food color. Cook over medium heat, stirring constantly, until mixture thickens and boils. Boil and stir 1 minute. Remove from heat; cool 10 minutes. Stir in berries. Cover and refrigerate until serving. Heat oven to 450°F. Grease bottom and sides of rectangular pan, 13x9x2 inches, with shortening. In medium bowl, mix flour, 1/2 cup sugar, the baking powder and salt. Cut in butter, using pastry blender or crisscrossing 2 knives, until mixture looks like fine crumbs. Stir in milk, almond extract and eggs just until blended. Spread in pan. Sprinkle with 1 tablespoon sugar and the almonds. Bake shortcake 10 to 12 minutes or until light golden brown. Cool completely, about 1 hour. Serve with Triple-Berry Sauce. 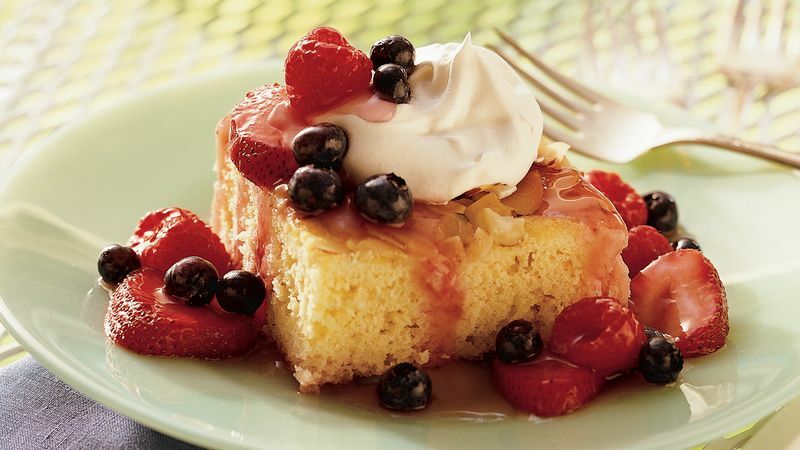 If brunch is in the plans, the almond shortcake makes a great coffee cake. Serve it slightly warm from the oven with butter and strawberry jam. Add a spoonful of whipped cream to each serving. You can use any combination of berries that equals 7 cups.